The early morning rains on Saturday, 29th October, 2016 was definitely a sign of good things to come at Apam. Though I got stuck in the mud on the way to the Ehalakasa Festival 2016, I arrived in time for the festivities. This was definitely an improvement from last year. The sound was better and there was a band – Genius Hive Band. As an artist who has visited numerous shows and considering the line up in store, my expectations of a quality show was short sighted. The festival was EXCELLENT! Definitely ONE HONDRED! Threw me off guard completely. The festival started with an open mic session which saw up coming artists perform before the main event. Poetry, dance and rap graced the stage as the Two Idiots, Dr.So and Gen.Ntatea ushered them as MC’s. Students from GHANATA were part of the open mic session and coloured the event with their art. 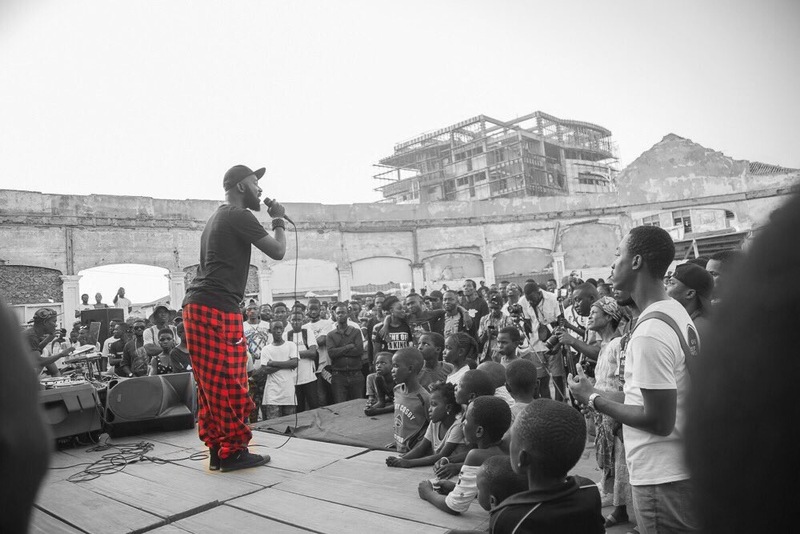 Their confidence, stage craft and words pave a promising future for the art scene in Ghana. This line stuck to me throughout the festival. It’s similar to the saying “no man is an island” but puts more emphasis on racial unity as the way to get things done. Great minds are definitely blossoming on our shores and this goes to show the importance of Ehalakasa’s involvement in schools. Their workshops have definitely molded artists for the future. The event was graced with the presence of Ghana music legend Ebo Taylor, who opened the main show with a short speech encouraging artists to continue in their craft. The festival was definitely an African one. We had Philo ﻿from Ivory Coast, Faithful from Cameroon and Donald from South Africa. Each artist had vibe that interacted with the audience and created a memorable performance. Donald’s “Hook em Up” Performance got the audience performing with him and our French brothers from Ivory Coast and Faithful tried their hands at Fanti and got us waving our hands and bumping to French. Kacey Moore’s performance was a medley of genres. Hiphop and High Life mainly but I am sure the was some Reggae or Dancehall in there. The energy, the highs and lows in his tone accompanied by the band definitely made my body move. The host of Kona Live with Kacey Moore delivered and set the stage for the main act for the festival, Worlasi. What follows Worlasi is hard to explain. His style is unique and laid back. Effortless and smooth. I could go on and on but let me stop and say that this guy has a way with his music and audience. He broke down on an intimate level why the songs he performed were written in a manner that you don’t get when you listen to his ŋusẽ mixtape. My favorites of his performance was “Possible” and “Nukata”. What I loved about “Possible” was that it was an inspiration to the art community to keep pushing. He encouraged all by reminding us of how he had dreams (like we all do) of meeting influential artists like Da Hammer, Sarkodie and Manifest. He elaborated that he had met all these people and they all came to him and not the other way round. He concluded by saying that if your work is good people will come looking for you. Worlasi concluded the event in style and reminded us that not only is anything possible but that you can have fun doing it. The Two Idiots were excellent hosts and need to be given more events to showcase their with and humour. Without them the event wouldn’t have come off the way it did. The sad thing about the festival was that it was not well patronized. That is what needs to be worked on next year. The Haduwa Cultural Institute in Apam, Central Region is a beautiful beach location booming with opportunity. I challenge you all to make it a point to come out next year with a change of clothes so you can have a taste of the beach as well. Ehalakasa did a great job in pulling this together. I know a lot more can be done but together anything is possible so let’s make it count. Next PostNext It's a Boy!